When Boeing announced the launch of the Office of UK Industrial Capability at a UK Supplier Showcase held last month in St Louis, USA, I knew it was going to be a productive few days for both parties. Boeing’s confidence in the UK market was welcome news for Members concerned about the impact of a no-deal Brexit. And, with 260 Boeing representatives attending, there was no better time for attendees to demonstrate their capabilities. In this blog, the second in the series, I share what we learnt about Boeing opportunities and future plans. An enterprise-wide team, the Office of UK Industrial Capability builds on Boeing’s long term plan to deliver more investment and innovation into the UK supply chain. Based in Seattle, its aim is to enhance the continued competitiveness of Boeing’s UK supply chain and increase Aerospace and Defence technology investments in the UK as production rates ramp up and new aircraft programmes are added. According to Val Bring, Boeing’s Global Supply Chain Director, Boeing source 65% of what goes on to their products; representing a great opportunity for attending Members to demonstrate solutions that are innovative, less expensive, more durable and meet customer’s needs. 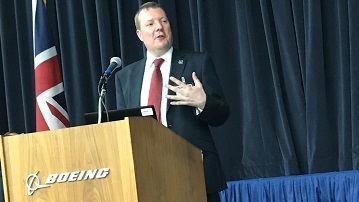 Huw Walters, Director Economic Security and Prosperity (pictured), confirmed that the relationship between Boeing and the UK is growing in strength all the time. He reminded the audience of another milestone announced just prior to this event with Boeing becoming an Associate Member of the UK Defence Solution Centre, a joint Government and Industry body in the UK working to boost UK Defence exports through better alignment and collaboration. Boeing has a growing interest and relationship with the UK and wants to build on its eight year partnership. Currently, the UK is Boeing’s second largest supply chain after the US, supporting 74,000 UK jobs (2017 figures and an increase of 33% from five years ago), and valued at £1.8bn. Last month it opened its first European manufacturing facility in Sheffield, where actuation systems for Boeing next generation 737, 737 Max and 767 aircraft platforms will be manufactured. At RAF Lossiemouth, work has started on the P-8 Maritime Patrol Support Centre, a 50/50 investment between Boeing and MOD that will employ over 400 personnel, and at Gatwick Airport, a new commercial maintenance facility is being built for Boeing Global Services, to service both their single and twin aisle aircraft. Boeing is currently a $100bn company (Boeing Defence is currently worth $21bn) with a goal of being a $200bn company in the next 10-15 years and to achieve this they need the supply chain to grow their business. It is evident that the relationship and opportunities with Boeing are growing for the UK Aerospace and Defence industry supply chain. As our industries seek to make themselves as competitive as possible in international markets after Brexit, it is important that great opportunities like those that exist for companies to work with Boeing are fully explored. 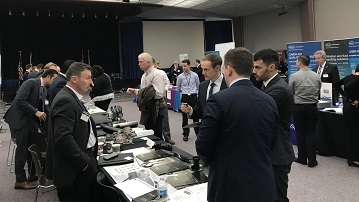 Boeing’s UK Supplier Showcase was part of our Meet the Buyer programme developing opportunities for our Members to access and engage with Primes. We actively encourage our Members to submit expressions of interest for these events, so please do look out for further opportunities in our events centre and get in touch.